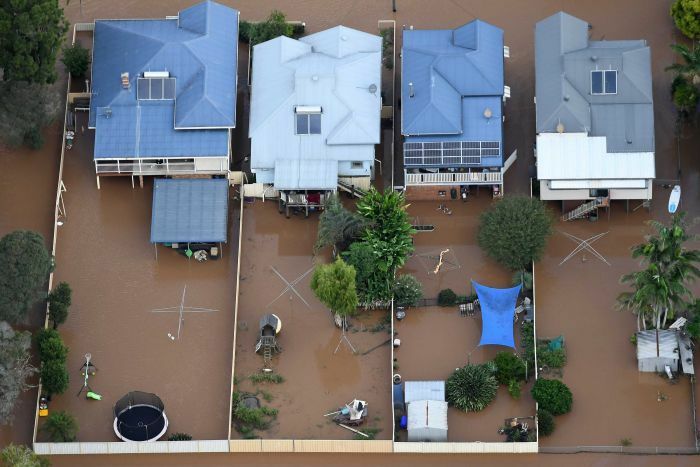 With Australia experiencing the aftermath of Cyclone Debbie and record-breaking rains and severe flooding in south-east Queensland and along the north coast of New South Wales, here’s a look at how global warming has, and will, push floods and cyclones to new extremes. Warm air can be more humid than cold air, that is, it can hold more water vapour in absolute terms. And atmospheric water vapour content increases seven per cent for each 1-degree-Celsius increase in global average temperature, establishing the conditions for more intense rainfall events. The frequency of major flood events (defined as events which caused extensive flooding within 50 kilometres of the coast, or inundation that extended 20 kilometres along the coast) along Australia's eastern seaboard has doubled in last 150 years, with climate change one of the possible factors, senior Bureau of Meteorology researchers say. Record-breaking heavy rainfall and a clear upward trend in downpours over the last 30 years fits in with global temperature rise caused by greenhouse gases. Statistical analysis of rainfall data from 1901 to 2010 around the globe, shows that from 1980 to 2010 there were 12% more of these intense events than would be expected in a climate without global warming. Wet regions generally saw a bigger increase in deluges and drier regions a smaller one. In southeast Asia, the observed increase in record-breaking rainfall events is as high as 56%. Giant air streams pushing new extremes: The increase of devastating weather extremes in summer, including floods, is likely linked to human-made climate change, mounting evidence shows, with the recent discovery of giant airstreams circling the Earth, waving up and down between the Arctic and the tropics. These planetary waves transport heat and moisture. When these planetary waves stall, droughts or floods can occur. Warming caused by greenhouse-gases from fossil fuels creates favourable conditions for such events. Cyclones, in part, draw their energy from the temperature of the ocean's surface waters, so a warming climate and ocean puts more energy into storms, including cyclones, loading them with more rainfall, and stronger winds pushing more of a storm surge. 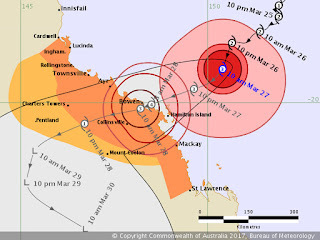 The recent Climate Council brief notes, “Increasing temperature of the surface ocean affects the intensity of cyclones, both maximum wind speeds and in the intensity of rainfall that occurs in association with the cyclone.” The force exerted on buildings and structures when cyclones make landfall increases disproportionately with wind speed. The Council also notes that: “Tropical cyclones form most readily when there are very warm conditions at the ocean surface and when the vertical temperature gradient through the atmosphere is strong. As this vertical gradient weakens as the climate continues to warm, it is likely that fewer tropical cyclones will form”. Whilst the best evidence scientists suggest cyclones unlikely to increase in number, a 2013 study challenges the status quo, suggesting they will occur more frequently, as well becoming more intense. In 2013, researchers reported that the stronger hurricanes in the North Atlantic, the South Pacific and South Indian Oceans have become more intense. The same year, the UN meteorological agency concluded that climate change is making super typhoons worse. In 2015, an international research team found that a warming planet is already stoking the intensity of tropical cyclones in the north-west Pacific and their ferocity will continue to increase even with moderate climate change over this century. More broadly, a 2010 study found that "future projections based on theory and high-resolution dynamical models consistently indicate that greenhouse warming will cause the globally averaged intensity of tropical cyclones to shift towards stronger storms, with intensity increases of 2–11% by 2100.... higher resolution modelling studies typically project substantial increases in the frequency of the most intense cyclones, and increases of the order of 20% in the precipitation rate within 100 km of the storm centre. With sustained wind speeds of more than 310 kilometres per hour, Typhoon Haiyan in the Philippines in November 2013 was the most powerful tropical cyclone to make landfall in recorded history. The previous record was held by Hurricane Camille, which in 1969 hit the state of Mississippi with wind speeds of just over 300 km/h. Data compiled from the US National Oceanic and Atmospheric Administration shows sea temperatures were about 0.5 to 1 degree Celsius above normal in the waters to the east of the Philippines as Haiyan began forming. The waters cooled in the storm's wake, an indication of how the storm sucked up energy. Hurricane Patricia which hit Mexico in October 2015 achieved a record peak intensity with maximum sustained winds 345 km/h, making it the most intense tropical cyclone on record in the Western Hemisphere, and the strongest globally in terms of 1-minute maximum sustained winds. Cyclone Winston in February 2016 was the strongest tropical cyclone to make landfall in Fiji and the South Pacific Basin in recorded history. Superstorm Sandy which hit the north-east coast of the USA with devastating effect in October 2012 was made worse by unusually warm waters with increased the hurricane’s intensity. As well, human-caused sea level rise added to the storm surge, and on the stretch of the Atlantic Coast that spans from Norfolk to Boston, sea levels have been rising four times faster than the global average. Researchers say that “It is possible that subways and tunnels may not have been flooded without the warming-induced increases in sea level and storm intensity and size.” More broadly, the authors say that “‘snowmaggedon’ in February 2010, superstorm Sandy in October 2012 and supertyphoon Haiyan in November 2013, and the Boulder floods of September 2013, all were influenced by high sea surface temperatures that had a discernible human component. The Climate Council reported that climate change exacerbated the damage caused by Cyclone Pam, which left a trail of destruction across Vanuatu in 2015. Eastern Asia has been hard hit by weather-related loss events in the past three decades. Their number has increased by more than a factor of four, causing overall losses from weather-related events of some US$ 700bn during this period. The insured losses of US$ 76bn amounted to only around 10% of overall losses, with 62% of these attributable to Japan. Floods caused 56% of the overall losses in Eastern Asia, but only 30% of insured losses. The number of floods has increased strongly and is expected to increase further in the coming decades. With insured losses of US$ 16bn, the 2011 Thailand floods caused the biggest-ever weather-related insured loss in the region. After floods, it is typhoons that cause the greatest weather-related losses. New analyses indicate a clear cycle of activity for typhoons, and increased typhoon activity is expected over the coming years..."
And in Australia, The Age reports that new modelling has shown that a cyclone the size of Debbie could have catastrophic consequences on the Gold Coast and as far as Brisbane, with winds of 260km/h, in areas where many homes and towers do not meet cyclonic safety standards. As climate change pushes cyclones further south, tens of billions of dollars worth of infrastructure is at risk. Actuaries, who predict and model scenarios for banks and insurers, have warned properties could become "uninsurable" as premiums rise up to 250% to meet this global warming challenge.